The brain has an incredible capacity to support a lifetime of learning and memory. Each new experience fundamentally alters the connections between cells in the brain called synapses. To accommodate synaptic alterations, certain areas of the brain are highly plastic, meaning that have the ability to adapt to incoming information. Within an important brain structure for memory, the hippocampus, reside some of the most plastic cells in the entire brain, utilizing the process of synaptic plasticity to remain primed and flexible. Nestled between the highly plastic CA1 and CA3 regions, the rather inflexible neurons of area CA2 do not readily undergo synaptic plasticity, sharply contrasting the functional properties of its close neighbors. Once underappreciated, the CA2 region is now understood to be important for social, spatial, and temporal aspects of memory as well as the target of caffeine’s cognitive boosting effects. Determining the unique factors that confer this unique resistivity to plasticity could provide vital insights into the neural basis of learning and memory. Signaling diagram of a CA2 dendritic spine from a RGS14 KO mouse depicting mechanistic targets of the pharmacological inhibitors of Ca2+-dependent signaling pathways investigated in this study. Determined to elucidate this mystery of plasticity, researchers at the Max Planck Florida Institute for Neuroscience (MPFI) in collaboration with researchers at Emory University and the National Institute of Environmental Health Sciences, have for the first time identified a novel role for the CA2-enriched protein RGS14 and provided insights into the mechanism by which it limits plasticity. Paul Evans, Ph.D., a Post-doctoral Researcher in Ryohei Yasuda’s Lab, and collaborators, published a study in May 2018 in the journal eNeuro that links RGS14’s ability to curb plasticity to calcium regulation. RGS14, a specialized scaffolding protein, contains an amalgam of unique domains. Previous proteomics work by Evans and colleagues exploring these domains, established two new RGS14 interacting partners: CaMKII, a calcium signaling protein and Calmodulin, a calcium binding protein and crucial calcium regulator. 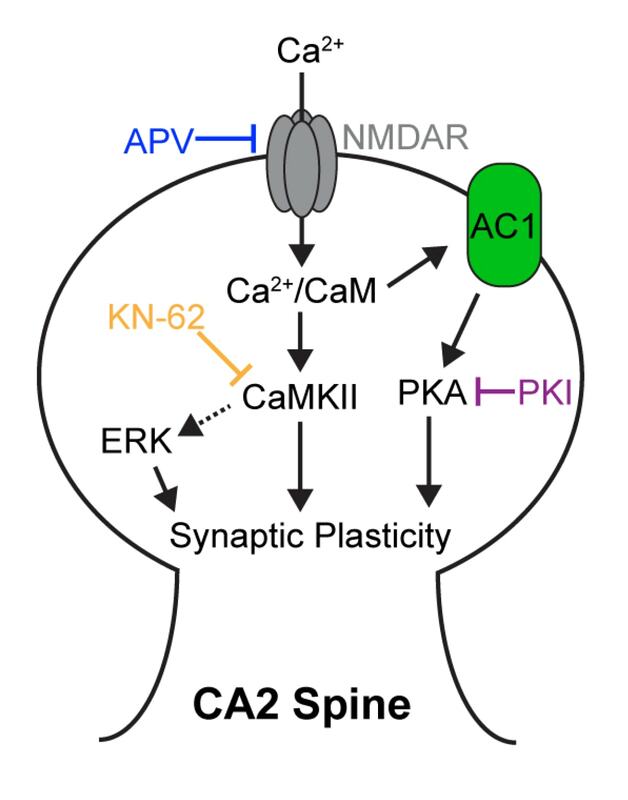 To initiate the signaling cascade of synaptic plasticity in CA1 neurons, the influx of calcium into the cell is required to drive the activity of CaMKII and Calmodulin. Due to this relationship, RGS14 is poised to act as a calcium modulator, gating plasticity in CA2. To verify this proposed relationship, Evans and collaborators probed in greater detail the masked form of plasticity, called Long-Term Potentiation (LTP), that is awoken in CA2 neurons when RGS14 is removed. Notably, mice lacking RGS14 display both enhanced learning in addition to robust CA2 synaptic plasticity, on par with levels reported in CA1. To ascertain if this latent CA2 plasticity is similar to the calcium-driven mechanisms of CA1, the team employed precise pharmacological inhibitors targeting critical calcium signaling molecules in mice lacking RGS14. Strikingly, the inhibitors abolished the newly unveiled LTP in CA2 neurons lacking RGS14, demonstrating the necessity of calcium signaling in CA2 and revealing similarities to the mechanisms that underlie plasticity in CA1. Confirming calcium signaling as a critical component of quiescent plasticity in CA2, Evans next investigated calcium influx in small neuronal compartments called dendritic spines during LTP in CA2 neurons from mice containing and lacking RGS14. Calcium transients in spines from mice containing RGS14 were significantly smaller than those in mice lacking RGS14, indicating that RGS14 plays an important role in adjusting calcium levels in CA2 neurons. Furthermore, the acute overexpression of RGS14 in CA2 neurons lacking the protein once again abolished plasticity and significantly reduced plasticity when expressed in the CA1 region. Increasing extracellular calcium levels reversed the abolition of plasticity, reinforcing the notion that RGS14 exerts its plasticity restricting properties through the regulation of calcium. “RGS14 seems to be special, acting as a molecular factor that puts the brakes on plasticity when it’s present, enabling specialized types of memory encoding. Establishing a greater understanding of the molecular makeup conferring subtle differences between brain regions, like those seen in CA1 and CA2, will allow us to better understand the mechanisms that underlie learning and memory,” notes Dr. Evans. This work was supported by National Institute of Neurological Disorders and Stroke, National Institute of Environmental Health Sciences, National Institute of Mental Health and Max Planck Society. The content of this article is solely the responsibility of the authors and does not necessarily represent the official views of the funding agencies. 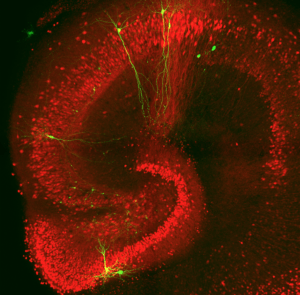 Cultured hippocampal slice showing sparse labeling of neurons with GFP (green) after ballistic gene transfer and immunoreactivity for PCP4 (red, a molecular marker enriched in dentate gyrus and CA2 neurons). RGS14 Restricts Plasticity in Hippocampal CA2 by Limiting Postsynaptic Calcium Signaling. eNeuron, May 21 2018, Early Release.